Let's get to the goods. 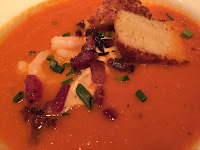 It was freezing rain that day, so I was happy the Tomato Soup was on the Winterlicious menu and this soup was epic. It had shrimp, smoked bacon, sour cream and milk bread topped with monforte cheddar. Hearty! Each bite was different. It hit the spot after coming in from the cold. 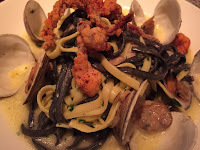 Keeping the comfort food vibe alive, I had the Littleneck Clam Linguine. The sauce was creamy and complimented the clams well. The crispy squid had a little kick! A nice addition to a mellow dish. Pasta cooked to perfection and I couldn't finish it! I tried, I really tried! But, there's always room for dessert! Feeling like a big kid, I had the Root Beer Float. This dessert made my day. The big mug and the long spoon brought joy to my face and made me forget how full I was. 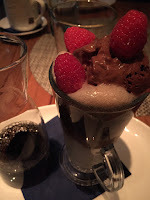 The root beer with the chocolate sorbet topped with raspberries was fantastic. Chocolate and raspberries are always good together, who knew root beer would make them even better?! I've never had service the way they do it here. You literally had ALL of the servers and managers come by at some point, but somehow they all came for a reason, so they weren't pestering you. I liked it. I hate needing something and not being able to find my specific server or asking someone else trying to find them. You could ask anyone anything and feel comfortable as they were all my servers and they were all able to help. Refreshing! A great experience! I'd love to go back!